When you want to eat a healthy vegan diet, it’s important always to have that kind of food in your fridge. Vegan menu planning is necessary and a bit different than making an omnivore menu plan. In three easy steps, I show you how to do exactly that. Of course, there are also kind people out there, that will do it for you. Some are even free and some are paid. 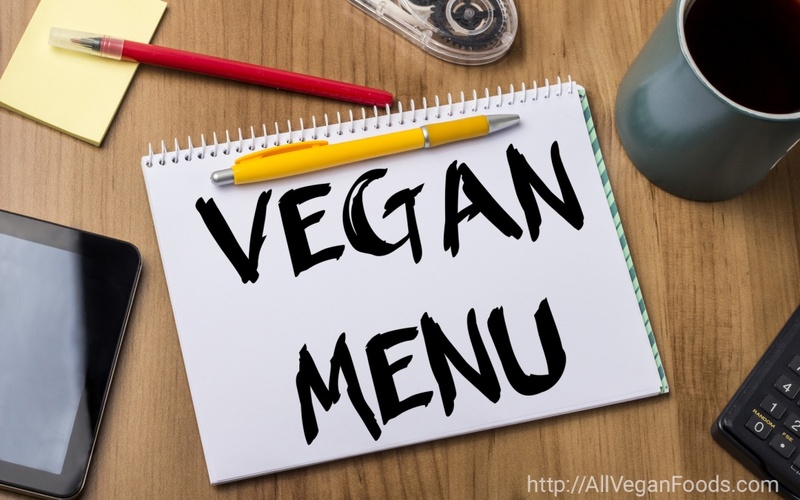 At the end of this post, I have included those websites I know of that offer a vegan menu plan made easy. The First Step is to decide which starch and protein you want to build your meals around. Starches are important because they make you feel full and gives you the most needed plant fibers. You want your meals to be both hearty and satisfying. Good sources of plant-based proteins are legumes and beans, quinoa, tofu, tempeh, nuts, and of course foods made from these ingredients. Good forms of starches are brown rice, beans, whole grain wheat or whole grain pasta, winter squash and potatoes, especially sweet potatoes. The Second Step is the texture. Often meals with only one texture have a tendency to get bored fast. Not only boring meals but you will also not feel satisfied. When I talk texture I am talking about creamy, crunchy, smooth and firm. Whatever you decide to cook be sure to include at least two different textures per meal. An example: A regular green salad could transform into a hearty meal by adding firm baked tempeh, crunchy sesame seeds, creamy avocado, and smooth cashew dressing on top. The Third Step is to upgrade the nutrient density. Which foods are nutrient dense? Leafy greens and cruciferous veggies are some of the most nutrient-dense foods you can add to your meals. Leafy greens are chard, collard greens, and kale. Cruciferous veggies are cabbage, broccoli, and radishes. I chose Garbanzo beans / chickpeas as the starch / protein, then I thought about what to make of the beans. I love casseroles, so a garbanzo casserole it will be. Next to think of is the texture, a casserole will be smooth if I put coconut milk in, I will need something crisp, so I will top with a few raw slices of onion. Serve with bread with avocado spread for the crunchiness. To amplify the nutrient density I will serve, as a side boiled cauliflower. So, I will serve a Garbanzo Bean Casserole, with vegetables, topped with slices of red onion & a slice of bread with avocado spread with nutritional yeast on the side. Microwave the spaghetti squash for 5 minutes or until you can easily cut it and fork out the strands. Prepare the remaining of the vegetables and set everything aside. In a bowl mix all the sauce ingredients and give everything a good stir until smooth. In an 8×8″ / 20×20 cm casserole dish, assemble the casserole: Layer the bottom with the squash, next layer chickpeas, then zucchini, olives, mushrooms, and finally the sauce. Top the casserole with nutritional yeast and an extra sprinkle of basil. Put the casserole in the oven and bake for 25 minutes. If you want others to make the meals plans for you, here’s some good news – there are plenty ‘out there’. Here are those I have tested myself, they are all vegan, clean eating, whole grain and plant based. In other words Healthy Vegan Menus. #2 is Fork Over Knives price is $9.90 per month, you tailor your meal plans, it’s the most comprehensive meal planner I have yet to see. Forks Meal Planner this works great on a mobile too.